Two really positive stories emerged from Los Angeles in the past week, courtesy of the L.A. Times and ESPN.com. The first, particularly comforting to Angelenos, touts the L.A. Homicide Rate Dropping to 1967 Levels. For natives that recall the 80’s and 90’s, serial killers and gangbang culture, and even the city’s own LAPD served to disturb the peace and incite the murder rate. The second article, from ESPN’s Tim Keown, perhaps indirectly attributes a small factor toward the declining homicide rate. The article is for ESPN Insiders, so I’ve copied & pasted. Note the continued reference to unprecedented opportunities for youth and their familes. Reminds me of when my father, at the time a Boxing Manager with his brother/my uncle Art as the Trainer, used to take me to the gym on 108th & Broadway in South Los Angeles to watch the fighters train, noting the dedication & hard work – coupled with passion, love & enthusiasm – that they brought to work each day. My father would note that though pugilism was seen as a barbaric endeavor to some, the fighters that maintained the discipline would be the ones that would move on to successful careers and lives post-fighting. 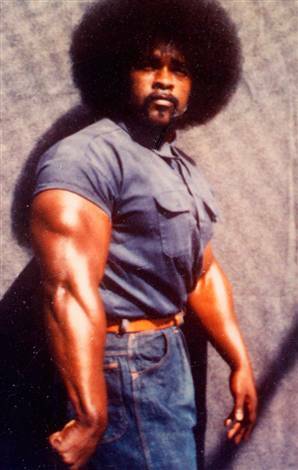 The simple opportunity of having that gym, that outlet, diverted the lives of a handful of youths away from the drug dealing/gangbanging lifestyle. And that is exactly what Snoop is providing to thousands of kids (article below). The homicide rate might be a bit of a stretch, but the opportunity is priceless and any correlation drawn from such magnanimous behavior is a positive note on which to close 2010 and head into the New Year. Thanks again everybody for supporting YallKiltIt during the 14-month run. I may publish here & there moving forward, but for the most part I’m done. It’s been a fun, crazy and spirited ride, and I’ve appreciated the comments & views, and the opportunity to share my thoughts with you all. This story appears in the January 10, 2011 issue of ESPN The Magazine. The high school coach watches with a mixture of irritation and amusement as the men in Snoop’s security detail take their positions. Gates are closed, entrances secured, driveways cleared. Al, the head of security, relays the latest to his colleagues: “One mile out.” The security troops are wearing Secret Service-style earpieces, and upon hearing Al’s news, one of the men — quite possibly the largest and least approachable human on the planet — walks slowly to a gate near the north end of the Crenshaw High football field on a cloudless, late-fall Saturday afternoon in South Central LA. Snoop has turned the corner. The security men roll their necks and furrow their brows in anticipation. The big man stands up straight and puts a hand on the gate. For this one moment, all worldly matters are secondary to the process of getting the man in the vintage green Cadillac — known as the Snoop DeVille — into a parking space. Despite Crenshaw’s ominous coordinates in the annals of Hood America, there are no visible threats around, just a bunch of prepubescent boys in pads and helmets trying to walk in cleats from the parking lot to the field without slipping or toppling over. But the men with the earpieces are dealing with the kind of fame that can’t afford to take chances. And besides, this is Semifinal Saturday in the Snoop Youth Football League. All day long, kids, parents and coaches come and go, every two hours another pair of teams shuffling into the stadium as two other teams leave. At stake for all six age groups: trips to the SYFL’s Super Bowl VI. 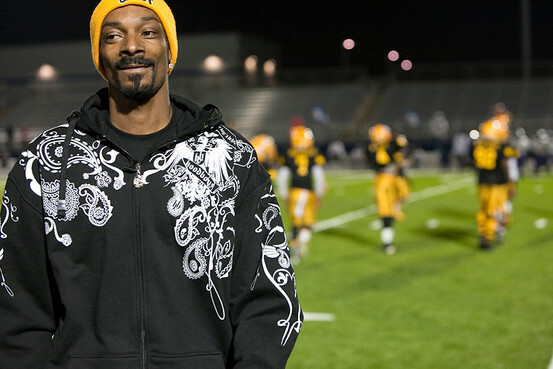 Snoop is arriving to coach a group of these boys, the undefeated junior midget Pomona Steelers, against the Crenshaw Colts. His son Cordell, a tall, strong-looking 13-year-old wearing black Snoop Dogg signature Skullcrushers headphones as he stretches, is a wideout/defensive lineman and one of the Steelers’ better players. 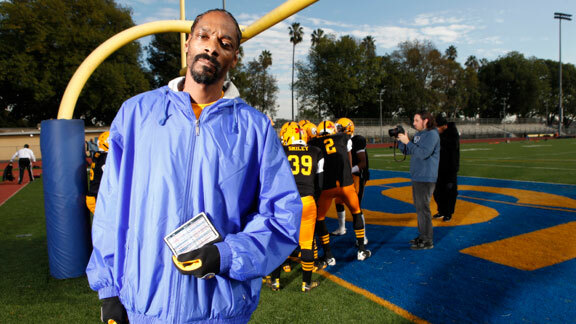 Snoop is a hero here, not just for his rap-and-Hollywood fame but for founding and funding a league that gives roughly 3,500 kids in some of the nation’s most notorious neighborhoods (Watts, Compton, South Central) a place to play football. Age groups range from the Future League (5 and 6) to Junior Midget (12 and 13). For $100 a season — waived or picked up by benefactors in cases of hardship — a kid can join a team in the six-year-old Snoop league. And this year, if he is good enough, a Junior Midget can play 13 games here, then fly to Dallas as one of the Snoop All-Stars to play the Deion Sanders All-Stars in the Snoop Bowl. Yeah, try to beat that. In the stands on Semifinal Saturday are families who wouldn’t be together otherwise, finding common ground where none previously existed. Broken families have been reassembled because of the league. Snoop himself is proof of this, saying, “If it wasn’t for the SYFL, I don’t think I’d have a family. This taught me how to be a family man, after being out and about.” They find something here, these mothers and fathers, watching their kids play. It’s remarkable what a game can do. Snoop is running late today, which adds some tension within the protective bosom of fame. The high school coach, meanwhile, is standing with one of his assistants inside the secured perimeter. He is here because roughly 15 hours earlier, on this very field, his Crenshaw Cougars beat Venice 63-12. (One week later, Crenshaw would beat Carson 45-7 for its second straight LA city championship.) Today the Cougars spent the morning at school watching film, and now the coach is in the parking lot, shaking his head as he watches the security team prepare for Snoop’s entrance. The coach is dressed exactly as he was on the sideline the night before: royal blue basketball shorts that end a few inches above the knee; blue-and-gold socks with “Crenshaw” written vertically along the calf; shiny royal blue high-top basketball shoes; a baggy royal blue T-shirt; a Crenshaw baseball cap and wire-rimmed sunglasses. He is south of 5’9″ and north of 250, and most of his players approach him using the same word first: Sir. He is clearly the boss in these parts. Well, at least he is when Snoop’s not rolling through the lot. Snoop is approaching the first gate. Final preparations are being made. Earth’s biggest human looks less approachable with every spin of the Snoop DeVille’s tires. The operation seems to have reached a critical stage. And with that, the high school coach opens his mouth and issues a bray of laughter that contains little or no humor. I will be sad to see this fine blog go. I do remember one night when we were at the boxing gym at 108th St. and Broadway when police sirens were blasting. There was a drive by shooting at 109th Pl and Broadway. 1 1/2 blocks away! The point I am making is no matter how bad the crime is, people respect sports because they know it is one of the few ways out to a better life! Well thanks for a fun run. hope your next project is awesome too. and magnetism. You’re the best.